WASHINGTON – The United States government apologized Friday to Guatemala for the “abominable” experiments in which U.S. scientists deliberately infected with syphilis and gonorrhea some 700 Guatemalan prisoners and mental patients in the 1940s. Secretary of State Hillary Clinton telephoned Guatemalan President Alvaro Colom to apologize for the unethical study, Assistant Secretary for Western Hemisphere Affairs Arturo Valenzuela said. The experiments, which came to light 64 years after the fact thanks to a study by Wellesley College medical historian Susan Reverby, were led by the U.S. Public Health Service and affected 696 people, most of them prisoners or patients at mental institutions. “We deeply regret that it happened, and we apologize to all the individuals who were affected by such abhorrent research practices,” Clinton said Friday in a joint statement with Health and Human Services Secretary Kathleen Sebelius. Implicated in the studies at the time were the office that later became the Pan American Health Organization as well as the U.S. National Institutes of Health. The study also said that there was “some kind of complicity” by the government of Guatemalan President Juan Jose Arevalo Bermejo, but its degree of implication is as yet unknown, the NIH director, Dr. Francis Collins, told the press. Efforts at compensation for Guatemala will be determined in two investigations, and depending on their conclusions, additional measures could be taken, Valenzuela said. For its part, the U.S. Institute of Medicine will try to answer the many questions left by the Reverby study, such as whether the patients were treated or cured once the experiments were over. A second investigation, by the Presidential Commission for the Study of Bioethical Issues, will call on “a body of international experts to review and report on the most effective methods to ensure that all human medical research conducted around the globe today meets rigorous ethical standards,” Clinton said. Reverby found that the experiments attempted to determine whether penicillin, used to cure syphilis, could also prevent the illness from spreading through the organism in the first stages of infection. However, no report of any kind exists on the conclusions drawn from the experiment, though some of the patients’ personal data and medical reports remain that make it clear there was at least one who died from an epileptic attack. The men were infected by visits from prostitutes who had the disease and by direct inoculation in their sexual organs. When these techniques failed, they were given an injection in the vertebral marrow. 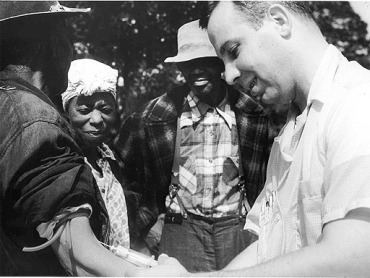 The team led by Dr. John Cutler, who left the study to continue with other syphilis research in the United States, encouraged patients to pass the contagion on to other people. Reverby came across the Guatemala experiments while seeking the context for her investigation of the Tuskegee case, in which the Public Health Service observed the progress of syphilis among almost 400 poor blacks in Alabama from 1932-1972. On its own territory, the United States has carried out in recent decades more than 40 studies that included inadequate contagion, Collins said.